Literally, it’s a thread that conducts electricity! So iPhone 5 dropped today (if you pre-ordered and hit the option to pickup in-store that is…) and “Apple Fans are Jubilant”. Big Whoop! $800 for a phone is really incredible especially considering advanced technology these days (should be readily available and definitely affordable) and it’s never $300 better than its predecessor so… But it does make this post somewhat more fitting. Don’t you hate it when it’s freezing cold outside and you have to text a friend or answer your smartphone but can’t because your gloves are on? I do! But not enough to have to wear one of those types of “digital-ized gloves” you see in a lot in sporting goods stores. But now I have another option, I CAN MAKE MY OWN PAIR! I just discovered this thread while browsing through a Knit Picks flyer on the train the other day. The photos above are from Knit Picks and if you look closely at the Pointer Finger and Thumb you can see a little added embellishment on the fingertips. Those little embellishments are stitched on using Conductive Thread! The Conductive Thread allows the wearer to operate touch devices like iPhones, iPads, Galaxy Tabs, your new Galaxy S3, (my Android HTC Inspire) etc. 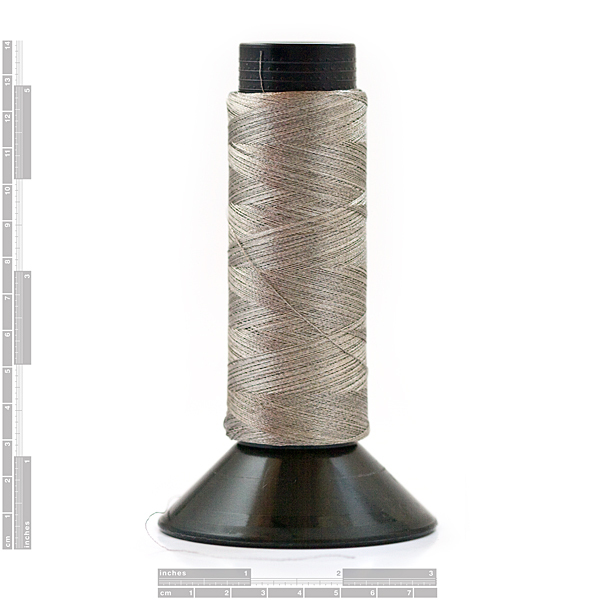 This Conductive Thread is a 2-ply thread made of steel fibers and can conduct electricity and complete circuits just like a wire. 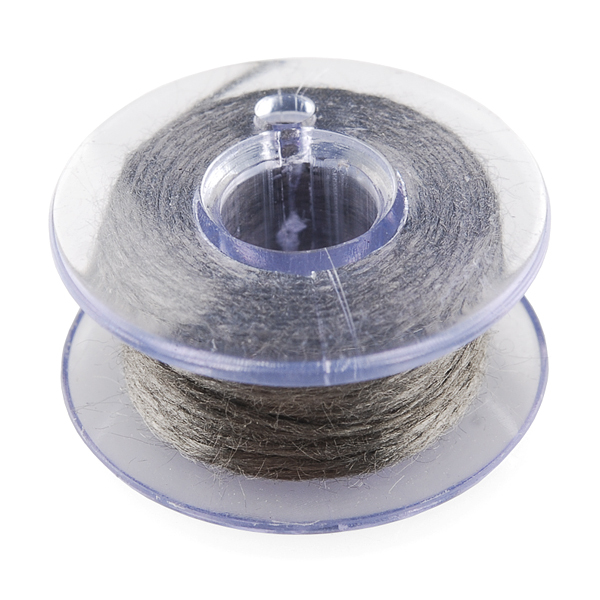 It comes in a little bobbin containing about 4-10 meters of this special thread. Simply sew it on to the fingertip of your next hand-knit gloves and voila! Instant “E-Tip” gloves. I don’t know just how effective this Conductive Thread is in practice but it could be worth a try for my next glove project. Firefly Baby Booties w. LED Lights! There’s been a lot of “digital” clothing and accessories for awhile like jackets that are wired to charge up your mobile phone when placed in a pocket or plugged into a panel and of course sport gloves by the likes of North Face or Marmot with conductive pads on the fingertips that allow you to operate your GPS tracker while scaling the iciest peak on Mount Everest. 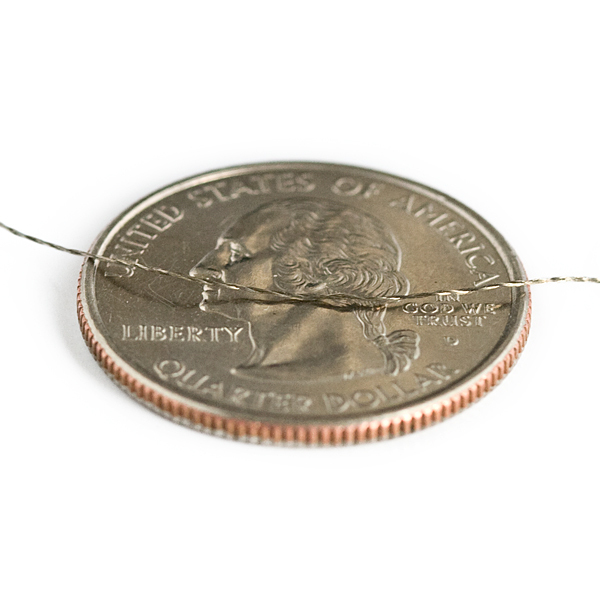 So this little bobbin of conductive thread is especially nifty because now it means we can add this to any one of our own homemade projects! GO DIY TECH! Electronic textiles (e-textiles) are fabrics that have electronics and interconnections woven into them, with physical flexibility and size that cannot be achieved with existing electronic manufacturing techniques. 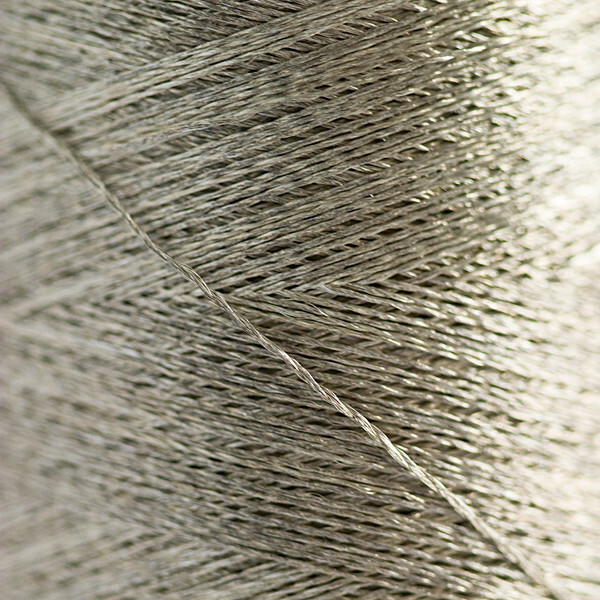 Components and interconnections are intrinsic to the fabric and thus are less visible and not susceptible to becoming tangled together or snagged by the surroundings. An e-textile can be worn in everyday situations where currently available wearable computers would hinder the user. E-textiles can also more easily adapt to changes in the computational and sensing requirements of an application, a useful feature for power management and context awareness. Makezine has a nice little blog post about it here. Googling “e-textiles” or “conductive thread” will also generate a wealth of info on anything from conductive fabric to wearable computers to programming arduinos (which is what threads like these are especially useful for). Conductive thread comes in bobbins or spools and can come in varying diameters, lengths, and resistances. Knit Picks sells this thread in bobbins of about 4-5 meters each for $4.99 each. 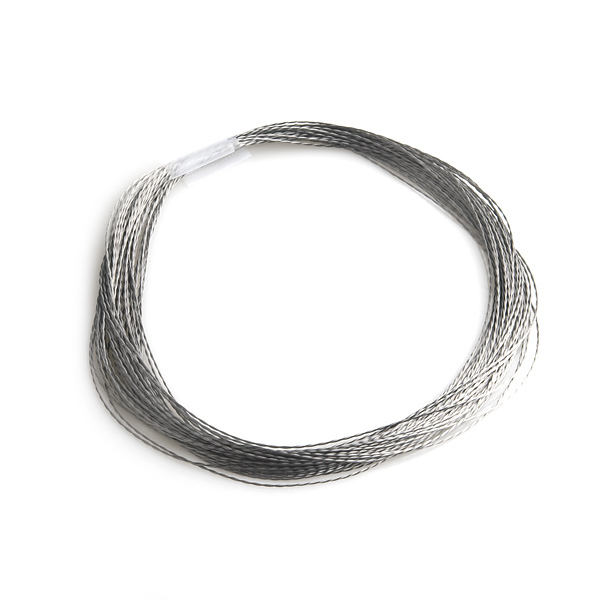 Spark Fun sells this Conductive Thread in various lengths and diameters for more advanced projects. Prices range from $2.95 for 30ft to 175 yards for $39.95. They have a wide range of 2-ply, 4-ply, thick, thin, extra-thick, and even thread with different connectivity resistances. So check out their page for the best option to suit your needs. Pingback: OMG! Heart » Catalytic Clothing – Pollution Cleaning Denim Jeans?